Simple Spinach Dal is healthy, wholesome, vegan and good for you. Serve it with steamed rice for a total comfort meal! I am really happy today, like really happy and the reason is that it’s not raining in Seattle! Oh my god, I am so fed up with this rain, like it has been raining non-stop. Day, night, evening, weekday or weekend – everyday and every time, non-stop rain. I like rain but this much I cannot tolerate. In Delhi, whenever it used to rain, I used to really happy. In fact we would wait for rains all year long and when it would finally rain in June/July we all would go out and play in the rain. I remember how much we used to beg mom to let us go play outside in that rain water and after some pestering she would eventually allow us to do that. We would make paper boats and make them sail in that rain water, play hide and seek and what not. That time we didn’t have laptops, video games etc. so this is how we used to play. Oh how much I miss that time! Mom had to literally drag us inside after we were fully drenched! Now that was the kind of rain I enjoyed, because you know it rained so hard and so rarely. Here in Seattle, first of all it rains all the time and second it’s this constant little drizzle. I find it so annoying. If it has to rain, it should rain like cats and dogs and get done with it. But no it will rain constantly, little drizzle which annoys the hell out of me. Anyway rant over! When it’s raining so much I feel like eating comfort food like my spinach dal with steamed rice. 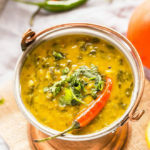 Spinach dal can me made using lot of lentils. Like you can make it with masoor dal (red lentils) or with chana dal. My reicpes uses toor/arhar dal and moong dal. I somehow like this combination the best with my spinach dal. This recipe is very simple and does not use several spices like most Indian recipes. I always love garlic with spinach, I think they are awesome together and so I used lots of garlic in my spinach dal. If you aren’t a fan, simply skip the garlic or you can add ginger in place if you like. Like most Indian dal recipes, this is vegan too. However you can use ghee in place of oil the recipe if you want. Ghee does taste amazing with spinach! 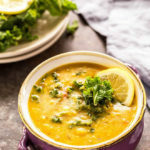 Looking for more dal recipes? Check these out! To a pressure cooker add the washed lentils, add 2.5 cups water, 1/2 teaspoon salt and 1/4 teaspoon turmeric powder. Cook at high flame for 2 whistles, then lower the flame and cook for another 7-8 minutes or till lentils are completely cooked. Let the pressure of the cooker come off on it’s own. Set aside. In case you don’t have a pressure cooker, cook the lentils in a pan till completely cooked. Once the seeds start crackling, add chopped garlic and green chili. Saute for a minute or till garlic just starts turning golden brown in color. Add chopped tomatoes, salt and cook for 2 minutes. We don’t want to overcook the tomatoes here. Add chopped spinach and mix. Cook for 2-3 minutes or till there’s no raw smell of tomatoes or spinach. Add the cooked dal to the pan and let it all come to a boil. Lower the heat, add more water if needed (I did add 1/4 cup water here) and let the dal simmer for 5 minutes. Check the salt and adjust to taste. Sprinkle garam on top and remove pan from heat. 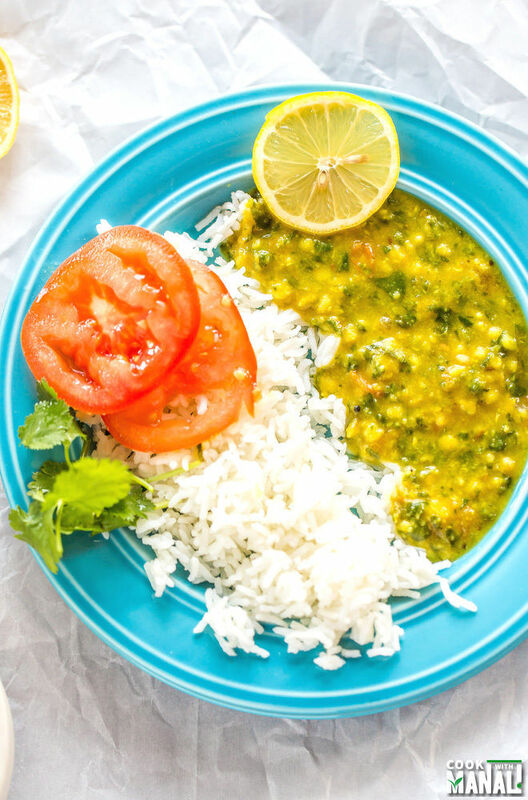 Squeeze in some fresh lemon juice and serve spinach dal with any bread or steamed rice! Lentils cooked with spinach and tomatoes. 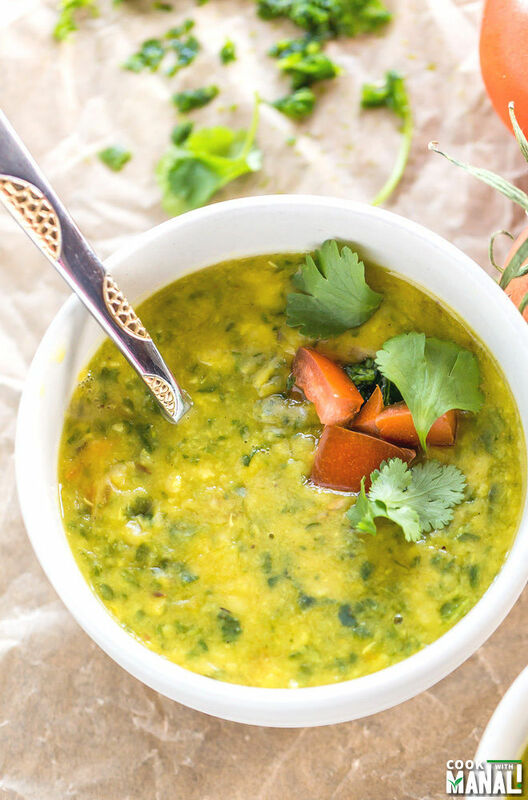 This Spinach Dal is lightly spiced, healthy, vegan and good for you! To a pressure cooker add the washed lentils, add 2.5 cups water, 1/2 teaspoon salt and 1/4 teaspoon turmeric powder. Cook at high flame for 2 whistles, then lower the flame and cook for another 7-8 minutes or till lentils are completely cooked. Let the pressure of the cooker come off on it's own. Set aside. In case you don't have a pressure cooker, cook the lentils in a pan till completely cooked. Add chopped tomatoes, salt and cook for 2 minutes. We don't want to overcook the tomatoes here. Add chopped spinach and mix. Cook for 2-3 minutes or till there's no raw smell of tomatoes or spinach. Add the cooked dal to the pan and let it all come to a boil. Lower the heat, add more water if needed (I did add 1/4 water here) and let the dal simmer for 5 minutes. So healthy yet so delicious and flavourful! Yay for no rain! I love the looks of this dish Manali! The simple ingredients and pretty color make it look extra delicious. Sounds like the perfect comfort food for the winter! Thank you Gayle! It sure it very comforting! Hey…look at the bright side! If it was colder out there, then all of that rain would just be snow. And then you’d have to go outside and shovel it or you’d be snowed in until June. (Not that snowed in is a bad thing…haha) I love spinach, and I’m digging dal lately, so I think this combo would be well received in our house. Sounds delicious! haha! Thanks David for helping me look onto the brighter side! I’m so glad you shared this recipe, Manali! 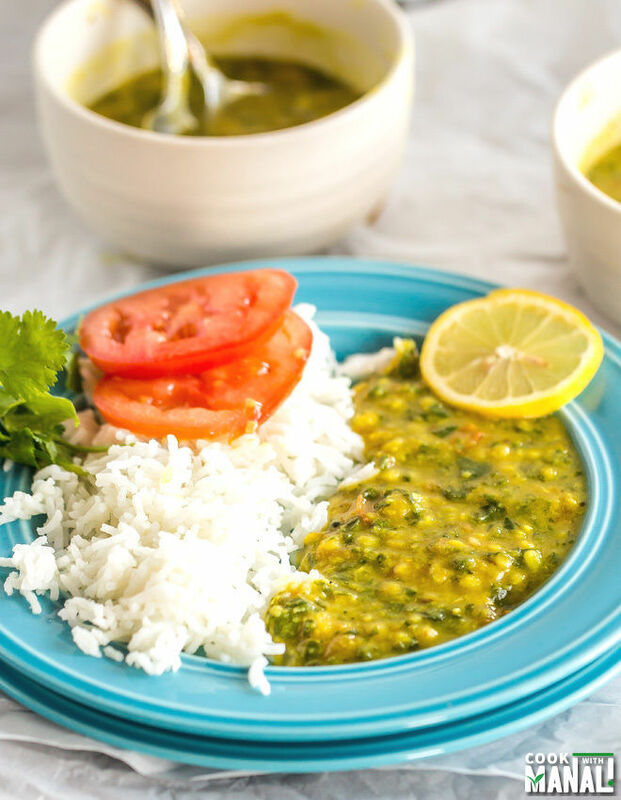 Spinach Dal is one of my favorite Indian dishes! I can’t wait to try this sometime soon!! Thanks Jen! Hope you like it!! 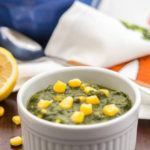 Spinach dal is such comfort food! When I was younger, my mom would have to fight me to eat it, but now I’m seriously craving a bowl of those warm and healthy lentils 🙂 Pinning! I’d really like to try this, Manali! I’ve recently come to appreciate lentils, but have never prepared them this way. I’m allergic to cardamom, which is in garam masala, so is there a good substitute, or should I just skip it? 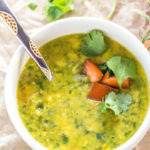 I love the colors of this dal! I think this is just perfect served over rice. Talk about total comfort food! Yum!!! I can have this anytime 🙂 Looks so beautiful, delicious and flavorful! I love the color of this dish! I can imagine its bright and fresh flavor! So glad it’s not raining anymore, I’m not a fan of it either but I am a big fan of spinach dal! This looks SO good, Manali! I love the fresh and bright color! Manali, let me comfort you by sharing that as I am typing, Delhi is also having drizzles and is colder than usual days!! !Dal is comfort food for me too! Can you pass me that plate! Yuuuuum! This is totally my kind of comfort food, Manali! I LOVE spinach and this needs to be dinner asap! So glad it stopped raining there… knock on wood it doesn’t come back for at least a couple days! LOVE this soup, Manali! Creamy and dreamy for sure! 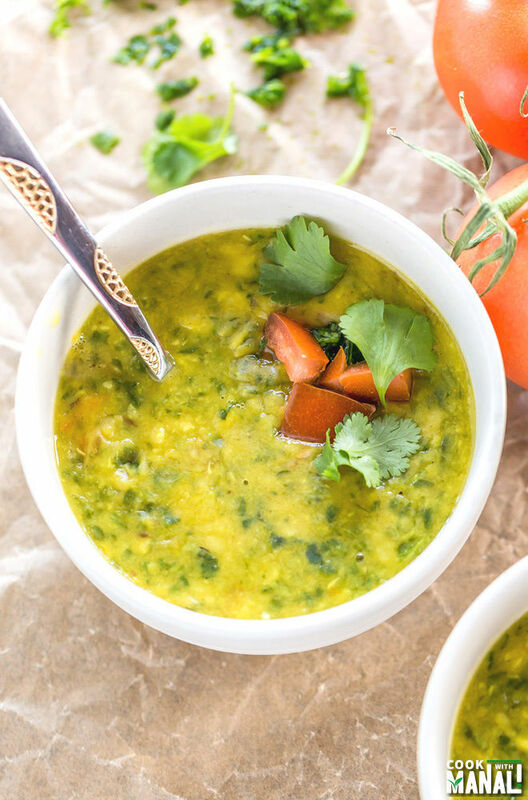 I could slurp up a few bowls of this spinach dal in record time! Cheers, friend! I’m so glad you are getting a break from the rain! I know it was awful when it rained here for 2 weeks straight, then we had like 2 days with none to be followed by another 2 weeks of nonstop rain! Boo! We used to play in the rain when we were kids too. What fun! Thank goodness you have these lentils as a delicious comfort food! GRAB ME A SPOON – I’m going in! Haha I am with you Manali!! I used to feel the same when In India. Ohh I remember making paper boats too – so much fun!! This dal is my favorite kind!! I am so hungry now!! Pinned! I know right, those were the days!! Thanks for the pin Ami! haha, I know the weather in Seattle! I used to live there so I know your pain! Well, enjoy this gorgeous spinach dal and the few days of no rain!!! It has stopped raining this week, thank god!! Thanks Alice! Like we discussed, I tried this yesterday! Needless to say it was great :). I am on a mission to try all of em as and when I get the chance :). Hello Vinay! so good to hear from you 🙂 yay, glad you liked it! Keep cooking! Hope to meet you soon in Belgium! Made this for dinner tonight with homemade naan and vegetarian samosas! It is delicious thanks for sharing your recipe ❤. Hi, this sounds delicious. I love Indian food, but I’m not that experienced at cooking it. I was just wondering, after you have cut the lentils, do you drain off all liquid before adding it to the spinach mixture? Hoping to try this week. Thanks so much. Hey! Once the dal is cooked/boiled you add all of it to the spinach mixture – along with the water. Indian dal is supposed to be on the thinner side, hope that helps! Just finished making this and it is delicious!! Thank you for an easy, healthy and flavorful Indian recipe! Do you soak the dal or cook it right after washing? I don’t soak the dal..
well then you cook the lentils on stove top until softened…this may take 25-30 minutes!